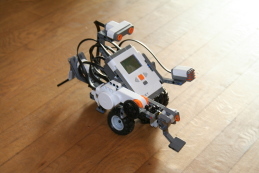 In this course we will develop projects for small wireless sensor motes and robots (e.g. Crossbow-mica2, Crossbow-Telosb and Lego-NXT). These embedded devices have usually small RAM and storage capabilities. Therefore, programming languages used to program such devices are either low-level or have very limited functionalities. We have developed a new Java Virtual Machine (JVM) called TakaTuka. The TakaTuka JVM has very small resource requirements and has full features of a JVM (e.g. garbage collection, object oriented design etc). In this course we will be using TakaTuka for developing interesting projects and programs on small embedded devices. This course is well suited for people with good programming background (C or Java) and does not require any knowledge of embedded devices. Having some knowledge of network protocols is a plus as one may develop a routing or transport layer protocol in his course. Furthermore, one may also develop a new interesting application involving sensors as these devices come with different kind of environment sensors. Lastly, a programming guru (expert) could also improve TakaTuka core or port it on a new platform. For more information look at the sample projects listed on the website.